Sometimes it is instructive to visit an elevator built by one of the competitors of the Tillotson Construction Company of Omaha, Neb., and its offshoots, J. H. Tillotson, Contractor, of Denver, Colo., and Mayer-Osborn Construction, also based in Denver. 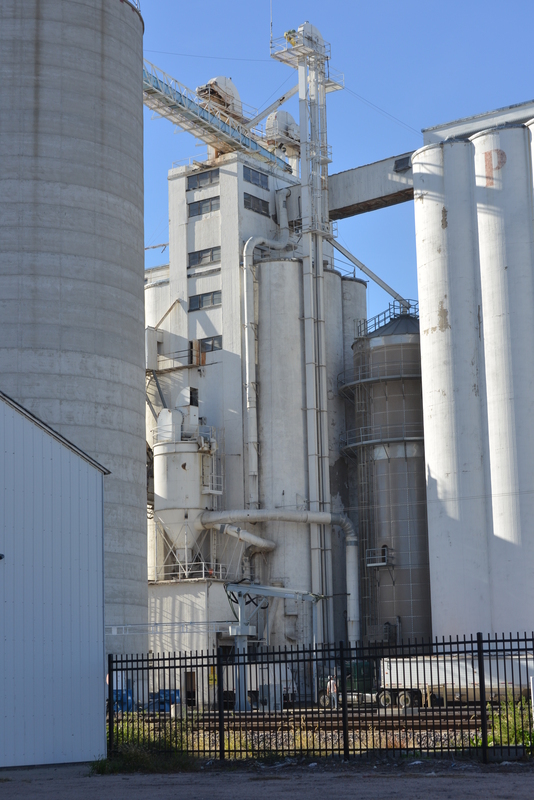 The elevator built by Johnson-Sampson in Grand Island, Neb. is a good example, for comparison, of a project built by the competition while our grandfathers were active in the business. One of our readers, Teresa Toland, mentioned the elevator and hoped that we knew something about it, since her father, Darrell Greenlee, had supervised its construction. A couple of years passed before I could follow up on her query. While traveling this fall, I took a detour to see the elevator and take photos. The old grain elevator stands now as a prominent Grand Island landmark, still serving its original purpose. It’s location, just off I-80 in central Neb., made it easy to visit. The elevator hummed with activity at the height of harvest. 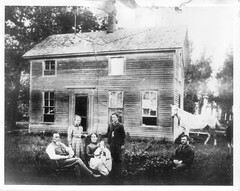 On this trip, my dad, Jerry Osborn, was along, so I did not take time to interview the employees–we were all tired after our hunting trip, and were ready to get home. But the elevator was a lovely sight and I was glad for the chance to see it. The original elevator, flanked by two annexes, was obscured behind a large modern concrete bin, so I got closer for a better look. The headhouse was unlike any I had ever seen. The elevator’s design formed a harmonious whole, much like the attractive Tillotson elevators its builder emulated, but it had taken a different direction and had its own look. It must have been a handsome sight when it stood alone, brand new, and gleaming white–the tallest thing around. The bin arrangement for the old elevator seemed conventional for storage in the 250,000-bushel class. 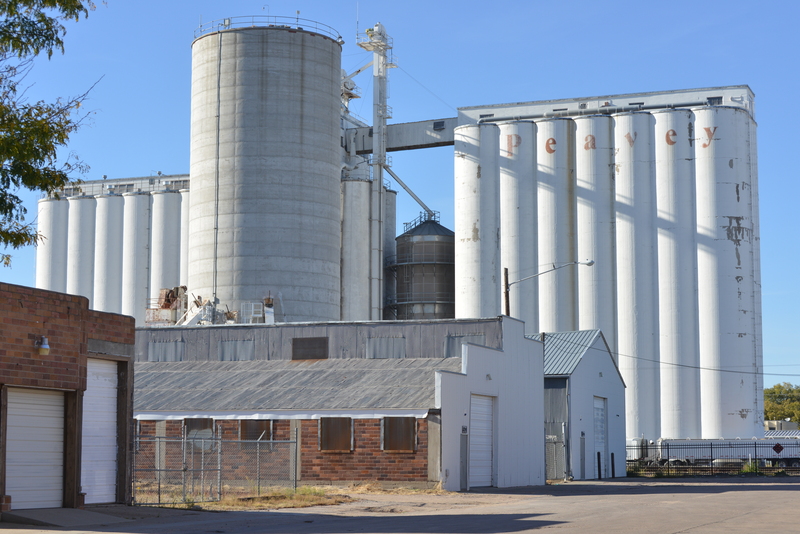 Adjacent to the main house stood a large capacity metal grain dryer. Including the annexes, the elevator complex was the size of a moderate terminal–the type of storage that would serve as a transit point for a rail or trucking hub. 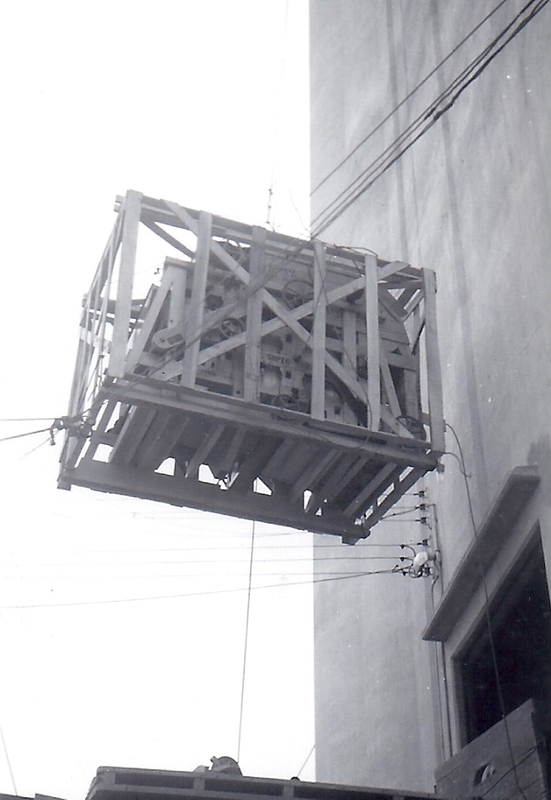 When Virgil Johnson, an early employee of Tillotson Construction, went out on his own, he built elevators in partnership with his Sampson in-laws for a few years. Darrell Greenlee, who supervised the construction at Grand Island, was one of his superintendents. 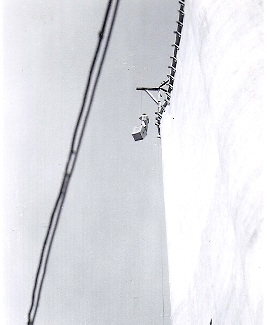 In this 1950 photo from our contributor Neil Lieb’s archive, we see a man standing atop a box as it’s hoisted to the top of Tillotson Construction Company’s newly completed Alta, Iowa, grain elevator.